The Snooze It command temporarily hides a message for the amount of time you specify. After the snooze interval is over, the message reappears in the original location. This is a great feature for those of you who use Inbox as a TODO list (you know who you are). Snooze messages to unclutter the Inbox and have them reappear at the right moment. 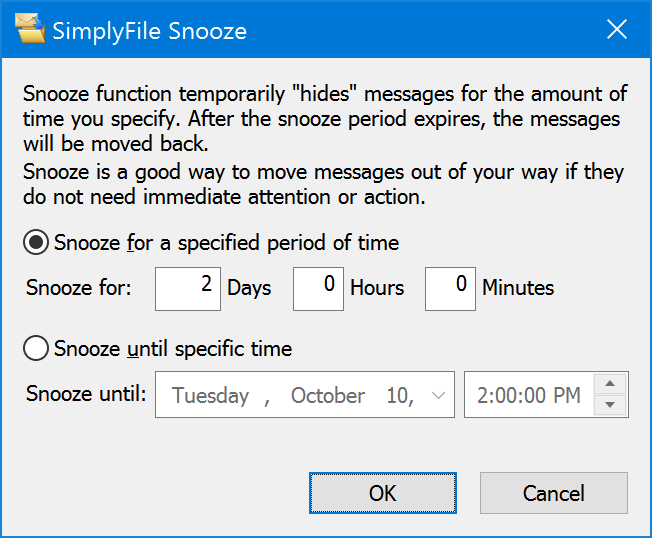 SimplyFile stores all snoozed messages in the Inbox\SimplyFile\Snooze folder. So if you need to get to a message before its snooze period is over, you can always find it there.